Opposite is a traditional view of the craft, but the reality in around 1920, was hard work in all weathers… as it is now. 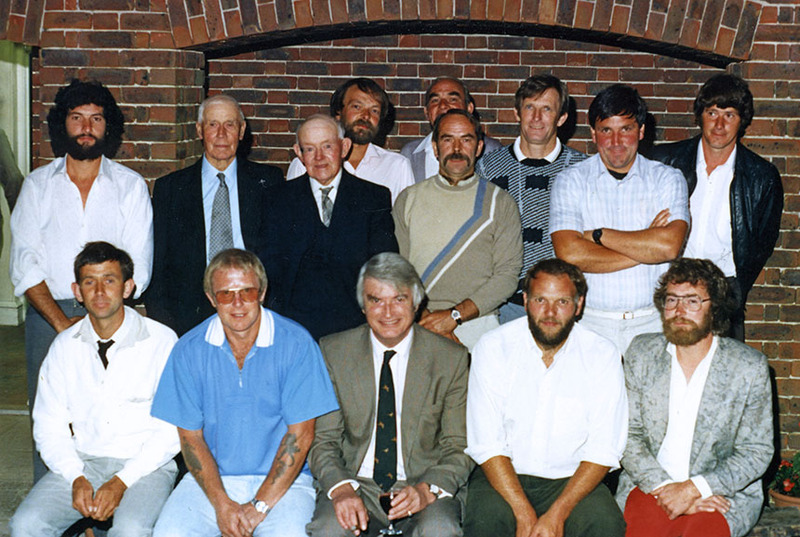 Sticking together… Suntanned members of the Dorset Master Thatcher’s Association, celebrate 40 years of cooperation. Along with a couple of the founding members, from 1947… The year when most county associations were formed. The size of thatching businesses vary. Most still consist of a skilled thatcher, working alone or with a trainee or labourer. If a large contract is carried out, then it’s normal practice to employ some extra skilled help; some thatchers specialise in mainly doing this sub contract work. The larger a firm grows, the more difficult it becomes for the thatcher to actually get on the roof and thatch; as more and more time is taken up, in estimating and running the various contracts. Some thatchers are happy enough with this situation, especially as they get older and the outside elements hold less of an appeal… Others like to keep their feet firmly on the ladder. No one is sure how many thatchers there are in Britain. Estimates vary, but suggest around eight hundred to a thousand practitioners of the craft. That works out, at around fifty to sixty roofs per thatcher… There are always many more young people wanting to become thatchers, than available apprenticeships; possibly leading to some unfair exploitation. The danger for the apprentice is that there can be an awful lot of labouring and not much training… If a thatcher is working alone, then every minute spent teaching is time and money lost. The only way the trainee can compensate for this, is to speed up the job by some labouring and then being allowed to closely watch the thatcher. The advantage here is that any teaching will be on a one to one basis. This may not be the case with a bigger firm. 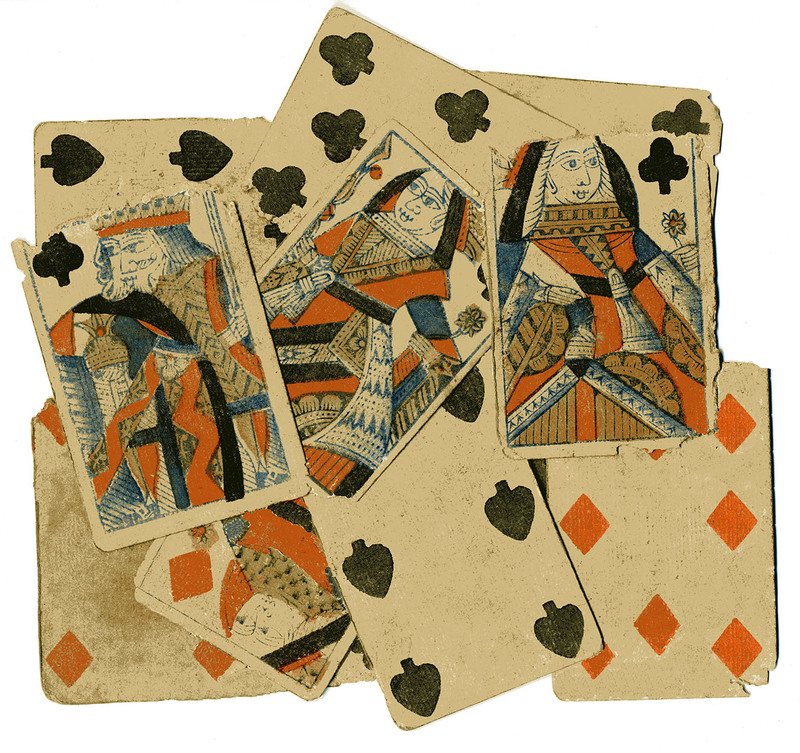 Not all saints… What caused these playing cards to be thatched in, near the eaves of a roof, I can’t say. 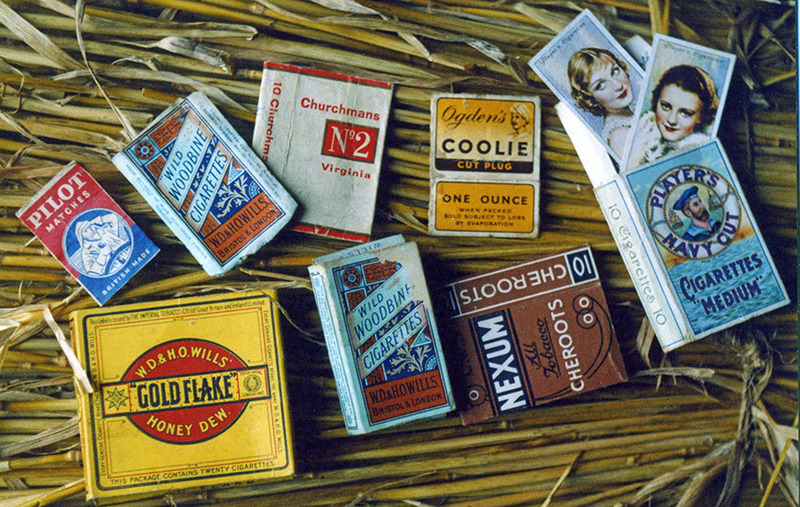 But someone, in around 1820, thought it wise to secrete them away… And smoking whilst thatching, has always been frowned upon. So the best way, is to bury the evidence, for later thatchers to find. When looking for a quote, the thatchowner in an area with a lot of thatch will hopefully be spoilt for choice. But if the thatched property is a rarity in the locality, then it’s probable that thatchers are to… Either way, the owner will want to employ the person who will give them the best job at a reasonable price. 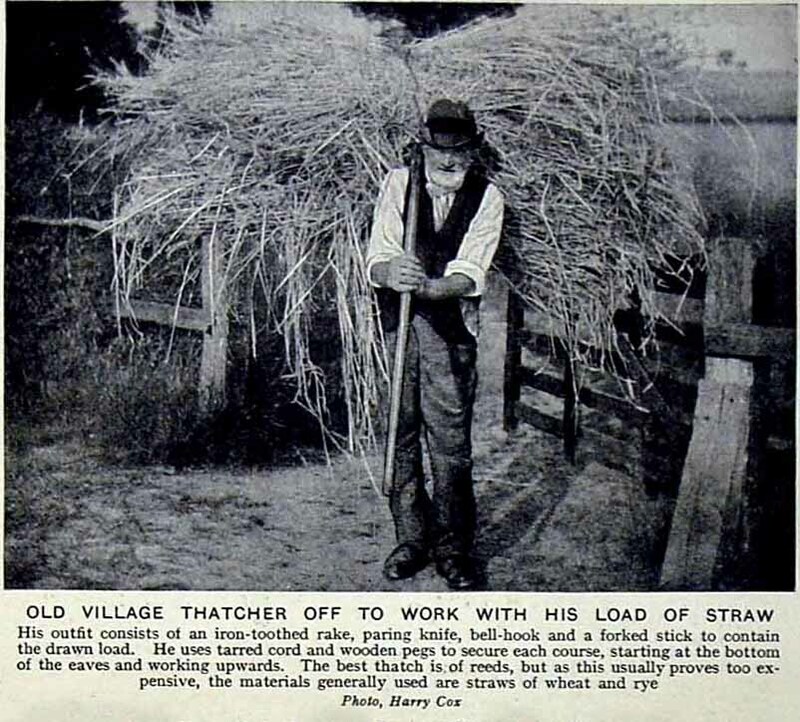 If the present thatch seems to have been done well, then the previous thatcher is an obvious choice; but with a new home, the buyer may not know who that was. The former owner may well do or the new neighbours may be of help. Any neighbours who live in thatched properties are a good source of advice. With the added bonus, of happily telling you of any problems they might of had with their thatcher! Before accepting any quote for major work, it is as well to see that the roof timbers are in a reasonable state. Most thatchers will look in the roof space, if asked; but the owner should remember, that thatchers are not qualified surveyors and they may feel the need to employ one. 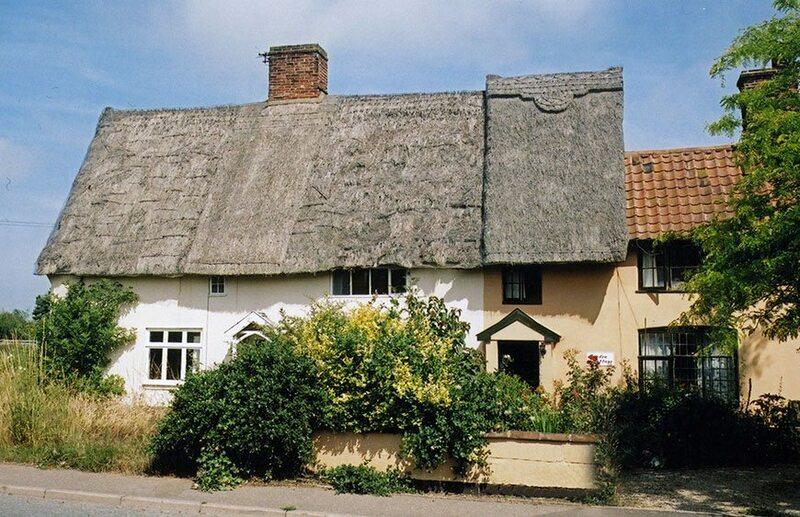 Thatch is quite forgiving and does not require a perfect roof structure; most old cottages have anything but that… Thus most thatchers are quite capable of completing minor timbering repairs. Having found someone to visit and discuss the roof; the next step is to agree on what work, if any, is required. (Hopefully the earlier page on maintaining a thatch, will have given a guide.) The problem for the owner is that the thatcher may suggest more work than is necessary. So if possible, it’s best to get a second or third opinion… When the amount of work is decided, the next step is to obtain a quote or estimate. They are not the same; a quotation is a fixed price, an estimate is not fixed, but is not expected to vary by a great amount. Most thatchers will give a quote or estimate, for free… Please don’t abuse the system and go for more than about three prices. I’ve been one of nine before now; wasting everyone’s time. It is important to ensure that all the quotes from each thatcher are for exactly the same work. It’s rather pointless having an estimate, for say a long straw roof with a simple flush ridge, from one thatcher and a quote for a water reed roof, with an ornamental ridge, from another. Sectional thatch… If possible, it can be more economic, to have all parts of a building thatched at the same time. If all the owners are agreeable, and need the work done. Were the thatcher’s working methods acceptable? e.g. Did they turn up every working day, weather permitting. Or was to job left, partly completed. Did they clean up regularly? Were both the roof and materials adequately protected from the weather? If a large thatching firm was involved; who actually turned up to do the job? The same thatchers every day; or lots of different ones, at different times? It is good working practice, to have the same people on the roof, from start to finish. Was the job done in a reasonable time? Were they happy with it? Once happy with the thatcher; it’s time to read between the lines of their quote. The following section should hopefully help. It’s best to be picky, thatching works can cost thousands of pounds! Some thatchers provide estimates, with a host of small print on the back; most don’t… Either way, the basis of a fair contract has to be… That the thatcher is willing and able to carry out a good job, in a reasonable time. And that the customer has the means to pay for the work, in a reasonable time. It won’t be mentioned on the quote but make sure that the thatcher is adequately insured, for public liability. This is for damage the thatcher may cause, to the property or the owner. If sub contactors are used, everyone on site will need to be covered against accidents or negligence; to themselves, each other, the owner and the property. Supply all thatching materials and fix a suitable coat of thatch. Finish with a sound ridge. Cover roof with wire netting and fix chimney fillets. Strip existing roof as necessary, dispose of resulting rubbish and leave the site in a tidy state. What all this can mean is explained below…. 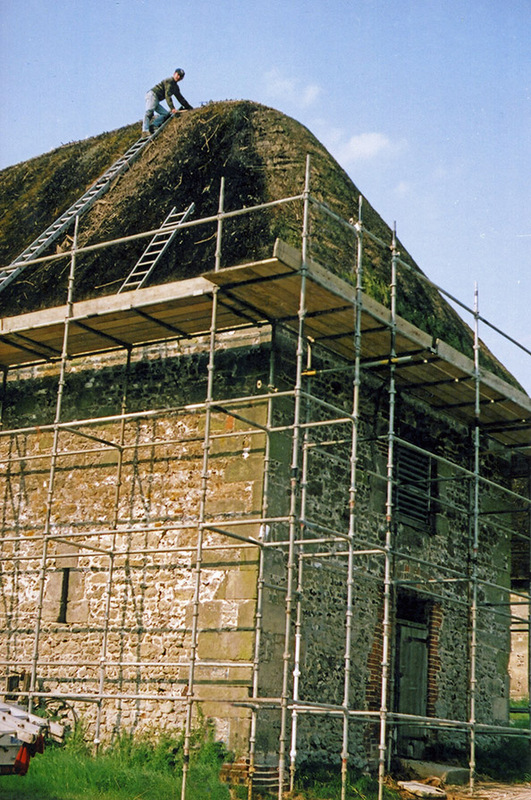 To comply with health and safety legislation, adequate scaffolding should be erected for major works to the roof; most thatchers employ contractors to do this. It is a good idea to check, that any damage that may be caused by them, is covered by the thatchers quote. Damage can occur, especially when any tiled extensions are scaffolded; tiles break easily… Also, nearby overhead electricity cables may need to be sheathed to render them safe, before any metal scaffolding is put up. A service that is rarely free. If the area is large enough, the thatcher may wish to store the new thatch on site. It should always be sheeted against the weather. 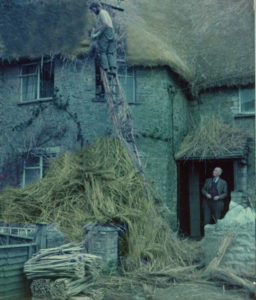 A supply of water may also be required to wet the thatch, if long straw or combed wheat reed are being used. What constitutes a good coat of thatch is discussed in the Beginners Guide and the Technical section. As mentioned, the exact type of ridging should be agreed beforehand. Preferably with an illustration of what is required. What constitutes a good ridge is discussed in the Technical section. To. Cover roof with wire netting and fix chimney fillets. Some of the virtues of wire netting have already been discussed; the owner should check to see if any is to be fixed. All types of ridge and most cereal straw thatching, will benefit from a covering. It is normal practice to also fix, either a mortar fillet or lead flashing around any chimneys. Lead flashing lasts longer but can be left stranded, as the roof sinks away over the years. Mortar can crack away but can follow the ridge line up and down; as it is replaced over time. With either material, it is important to ensure that there is sufficient width, to any fillet or flashing; especially under the chimney. 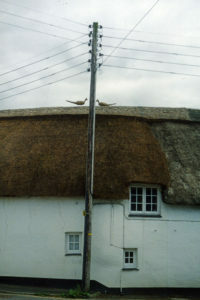 This is often a weak point in the thatch and can be helped, by a decent cover of mortar or lead. Six inches (150mm) is a good minimum width, for a fillet or flashing; under any chimney. The width, on the sides of the stack is less important. Before any work takes place, it is always a good idea to remove any valuable garden plants, from an area at least ten feet (3m) away from the working area… Because if you are having an existing roof rethatched, then some stripping off of the old thatch will be required. It is important to realise that there will be an awful lot of rubbish created by this and throughout the job. It’s good working practice to remove this litter as soon as possible, whilst dry. It should not be allowed to build up and cause a fire hazard. On the other hand, the owner cannot expect every piece of litter to be removed every day. At the end of the job a through tidy up should take place; but some evidence will remain, even on the best cleared sites. 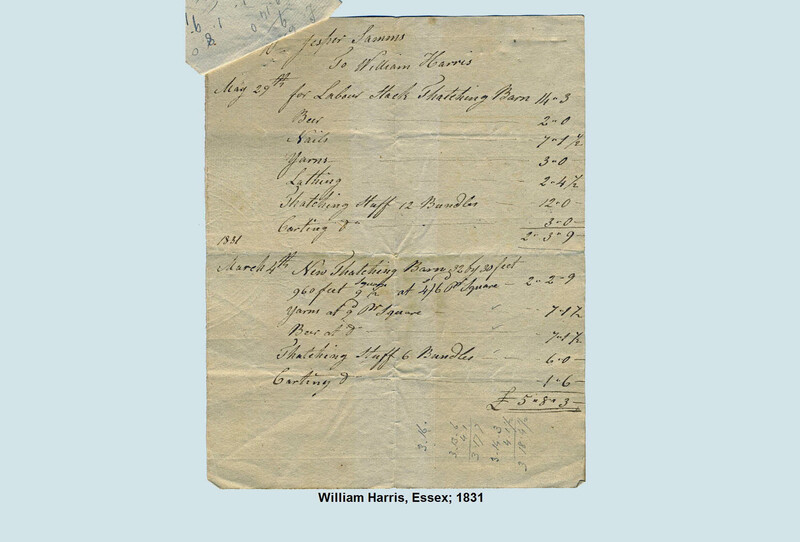 Enough of modern quotations, the slider below shows some thatcher’s bills and accounts dating from 1705. Much is recognisable today, except the amounts charged!! !